Mentoring365 is in need of mentors to volunteer for 3-month virtual mentoring terms. The program is available year-round and provides mentors and mentees with structured, relationship-building tools to develop and attain focused career goals. Mentoring365 mentors must be current members in one of the program sponsors (AGU, AMS, AWG, IRIS, or SEG). Mentors range in career stage from post docs to senior scientists. The most important requirements are that the Mentoring365 mentor is dedicated to providing guidance and has knowledge and experience that will be useful to the mentee. 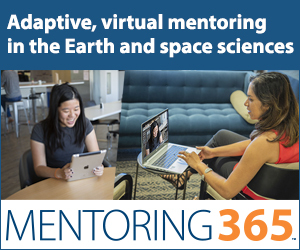 By serving as a Mentoring365 mentor, you’re giving back to the community and helping to support the next generation of Earth and space scientists. Once matched, the mentoring pair will be provided with adaptive resources over a 3-month period. Mentors and mentees are encouraged to work through the Mentoring Toolkit to identify and work towards their professional goals. Program objectives are best reached with consistent and regular check-ins. Mentors are asked to meet with their mentee weekly for approximately 30 minutes. Within a week of being selected as a mentor, the mentee should reach out to their respective mentor to establish an initial meeting. After the first meeting the mentor and mentee should establish a regular schedule to meet and discuss progress. In most cases, meetings will be held virtually. Students who are selected for the program will be able to see the above information to select their own mentor. It is up to both the mentor and the mentee whether or not they wish to continue communicating after the 3-month Mentoring365 cycle is over. Mentors will also be expected to fill out online evaluations throughout the program.